The Cuisinart GR-4N 5-in-1 griddleris in the top of Cuisinart indoor grills and the number one seller in the major online stores. Available in 2 versions. One is just the griddle and the second version is with waffle plates. One of the most important things to know is how much grill surface you have available and what kind of material is used. The Cuisinart gr4n comes with removable non stick plates that include a grease drain. The plates can be reversed for multiple ways of grilling and cooking. In our opinion a great plus is also the fact that the grill surface is BPA free like now is recommended for health purposes. The total grill surface is 200 square inches. Large enough for 4 steaks at the same time. 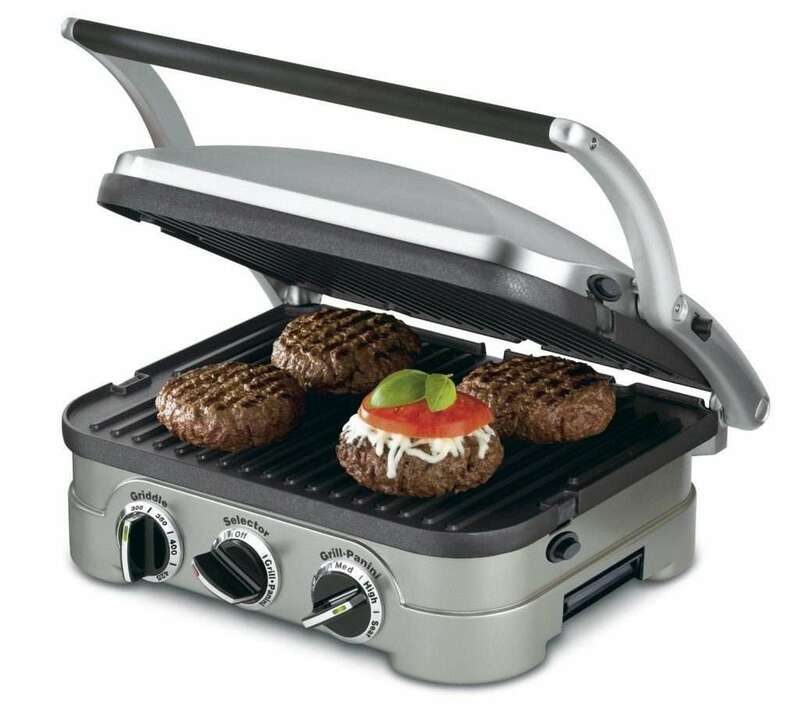 There are not to many bad things to tell about the Cuisinart GR 4N, 5 in 1 griddler. We have found over 5000 customer reviews and the average score is 4.5 out of 5 stars for this electric indoor grill. This Cuisinart is a five function unit – contact grill, Panini press, full grill, full griddle and half grill/half griddle. It was designed to work on countertops. 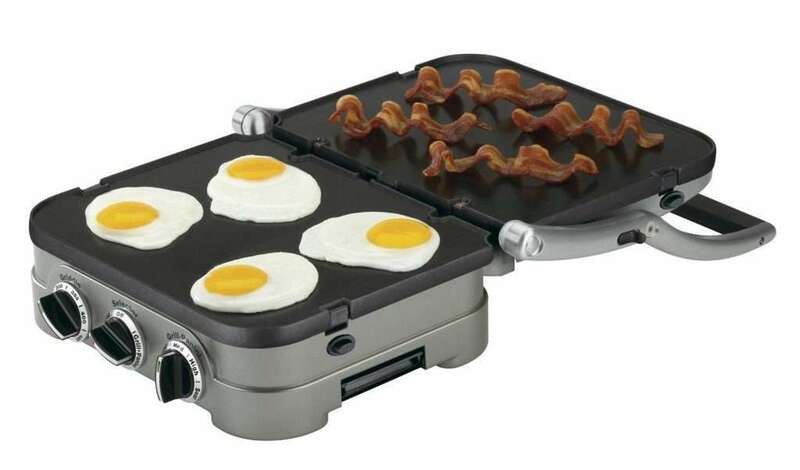 The griddle includes multiple features. The outer brushed stainless steel casing gives it a sleek look and impressive for a modern kitchen. The nonstick cooking plates are removable – making it easy to drain the excess oil for healthier cooking and to clean the stuff. 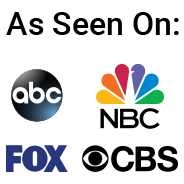 They are reversible too and provide you with an alternative option. Thoughtfully, they have added an integrated drip tray to collect all the fluid that is generated during the cooking. The griddle boasts of a panini-style cast metal handle and a floating handle that adjusts itself to fit the thickness of the food. There are temperature controls for different heat requirements (from 200°F to 425°F) and an indicator light will tell you that the system is working taking the guess work out. The griddle comes with a scraping tool. A recipe booklet has been included for the gourmand in you. For easy cleaning, the cooking plates, integrated drip tray and the scraping tool are dishwasher safe. The selector allows you to select the grill/griddle function depending on what you wish to do. The plate release buttons help to release them when you need to remove them for cleaning or otherwise. After you are done using the unit, allow it to cool before proceeding to clean it. Give it at least 30 minutes before you begin removing any leftovers or scraping. The rest of the system can be cleaned with a soft, dry cloth. It is recommended to use the griddle as a full grill and to avoid cooking bone-in chicken as it might not be cooked thoroughly. Using the full grill gives you more surface area to cook larger amount of food. If you are preparing steaks, burgers, chicken use the grill side of the plate. For making pancakes, scallops, eggs, the griddle is best. When using the unit as a half grill/griddle, half the grill plate and half the griddle plate can be used using either the grill/panini temperature or the griddle temperature control. If you want quick cooking or the cut of meat and vegetables is thin allowing faster cooking, choose the contact grill option using the grill plates. Maintain even thickness of the food so that the cover closes better. When cooking sandwiches, breads, and quesadillas, use the grill side to make Panini style sandwiches with grill marks on them. Alternately, the griddle plate also can be used or a combination of the two. The plates are designed to slide easily into place inside the unit. The cooking surfaces are BPA free. Use cooking spray on the non-stick surface of the plates to ensure better lasting results with the nonstick cooking surface. If you open up the griddle, you can use it to cook bigger quantities of food though they may not heat up equally resulting in food getting cooked at different times. When the unit reaches the desired temperature, it switches off and temperature drops to a certain level requiring the unit 3-5 minutes to get back to the original temperature to begin cooking again. All together we can recommend this indoor grill as a good buy. We still advise to use nonstick cooking spray to keep the plates in a good shape. This is a Highly recommended Cuisinart griddle That with all the features will give a lot of options to use and great result. With all the reviews we read we can only say that a lot of buyers love this Cuisinart indoor grill.